King Lear is one of Shakespeare’s great kings and a renowned part to play. We thought we’d have a chat with Max, Creation’s very own Lear, to find out a bit more about what it’s like to be him. So King Lear, that’s a pretty massive part to take on, how have you been finding it? In this production everyone has a massive task. I’m playing Lear but Natasha, Michael, Lucy and Morgan are playing multiple roles. Goneril and Regan simultaneously – now that’s what I call a challenge. The fact is we are a very happy family of actors led by a wonderfully creative, positive and down to earth director. In that kind of environment the process becomes a lot less stressful. Does such a tense subject make for a tense atmosphere in rehearsals? We rehearsed the first week at a pub in East London. I was sitting in a side room, having a cup of tea as gales of laughter echoed through the walls. I thought there must be some kind of party happening and then realised the laughter was coming from our rehearsal room. So, tense atmosphere? No. Our director has a great sense of humour and knows that a rehearsal room that has a place for laughter is likely to be a creative one. What are your impressions of other versions of Lear you’ve seen, have they influenced your take on it? I have banished from my mind all productions I have seen. Of course, I can’t completely banish the production I was in with Richard Briers as Lear, but fortunately that was twenty six years ago, so I can’t really remember that much about it. What I do remember is Richard breaking his leg, midway through rehearsals. He turned up the next day with a leg in plaster, which he was still wearing on opening night. That’s what I call a trooper. What’s it like to have everyone in the cast playing multiple roles around you? In addition to playing Lear, I am playing First Servant. That means I have two death scenes. First Servant dies heroically trying to save Gloucester’s second eye. Doesn’t that count as multi-roling? But more seriously, I think the multiple roles are highly effective and add to Charlotte’s interpretation of the play on a number of levels. From Lear’s point of view, it adds to his spiralling disorientation. 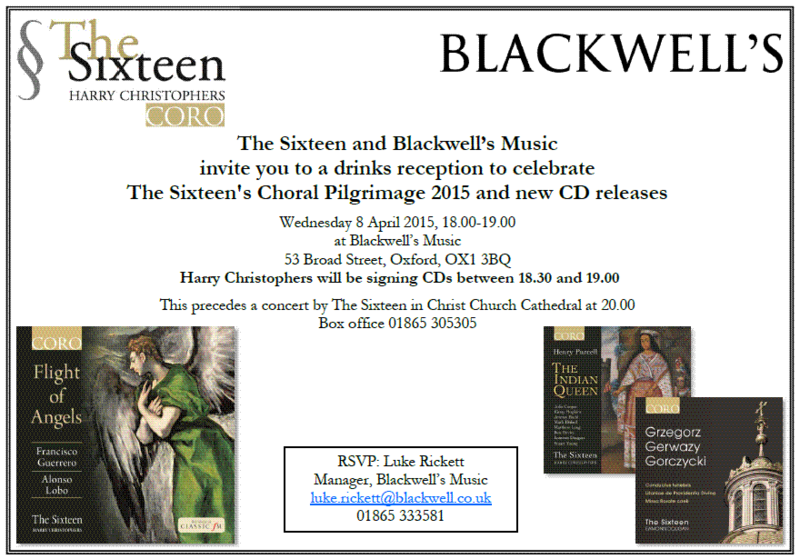 How do you feel about performing in Blackwells? 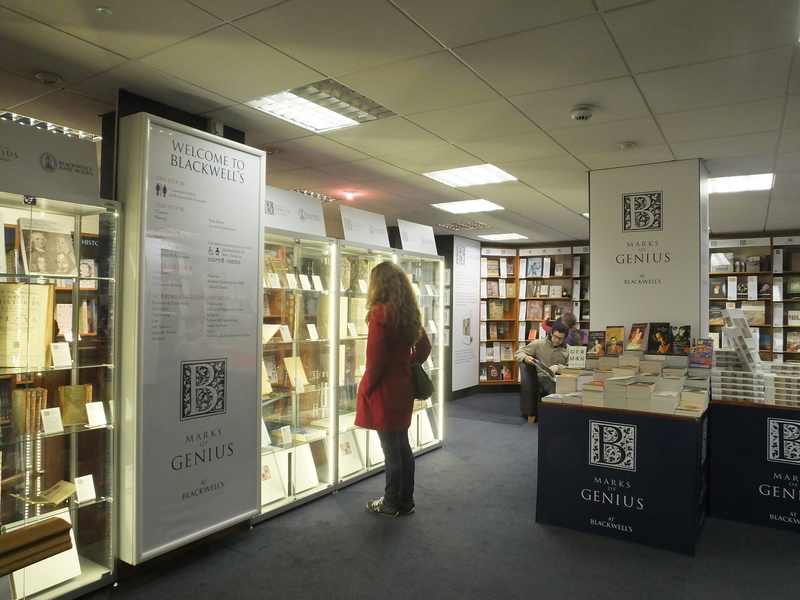 It’s an amazing space, an arena of bookshelves, crammed with ideas, knowledge, experience, imagination…. When I mentioned to various friends in London the location of the show, they were really excited. 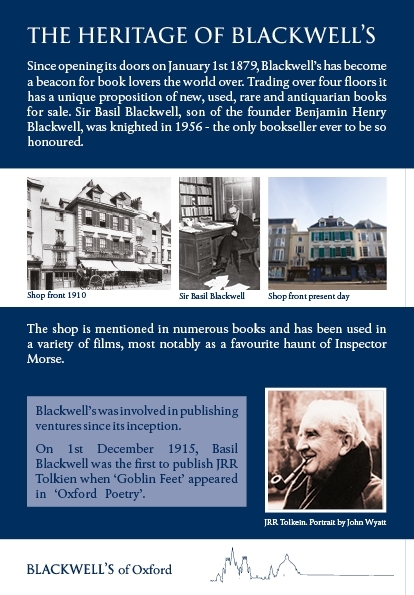 I hadn’t realised that Blackwell’s in Oxford was so many people’s favourite bookshop. My overriding priority is the staging of a production of a little play called The Magic Apple, which I have written for my son Brandan and his friends! An unexpected treat . . . a book that grabbed me instantly due to its unique voice – a bemusing quirkiness combined with a poignant bittersweetness. There are many things to recommend this book – its somewhat unorthodox narrative style which plays with the notions of who you think the main character is or isn’t, its ability to make you care deeply for things that you wouldn’t expect to (the tension generated out of a small-town summer fete bake-off competition is very impressive), its gallery of wonderfully rendered characters (some of whom you root for, others not), its observations on identity, inner lives, unrequited love, childhood, adulthood, the gap between the two and what makes us who we are. 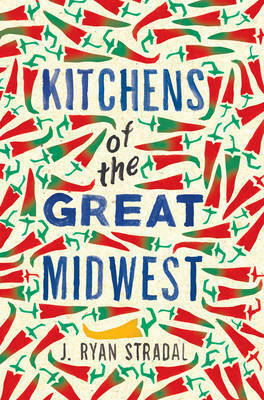 The ingredients that make up this debut work are reminiscent of a highly imaginative cookbook, which perhaps is a very apposite comparison given the extraordinary love of food which is evident throughout this novel. Yes, this book is a sort of literary smorgasbord full of succulence and rapture, concocted by a very talented author-chef who doesn’t play by the rules. You are left feeling thoughtful, entertained and touched by the powerful observations of human vagaries . . . Read this and then pass it on to everyone you love . 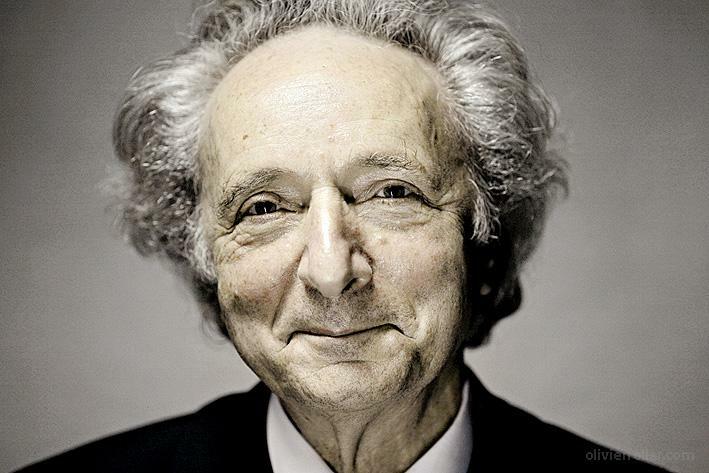 . .
Theodore Zeldin, the astonishingly intelligent and highly esteemed philosopher was, unsurprisingly, wonderfully profound – he talked for about 25 minutes to kick proceedings off and he explained his thinking behind the search for a meaningful life. Sitting on a tall coffee shop stool and speaking into the microphone, he radiated thoughtfulness and wisdom – he talked about (and I’m paraphrasing a little here as I stupidly wasn’t taking notes) our minds being like antique shops, full of – whether we realised it or not – ways of thinking from many different disciplines and centuries – the result being a rather cacophonous babble of different voices. He explained why, from his point of view, the search for happiness was not an especially fruitful one since, even if we found personal fulfilment and satisfaction – there were surely too many appalling things going on in the world for anyone to declare themselves happy. Instead, he said, what he found interesting was the pursuit of a meaningful life – and that meant a life characterised by empathy and understanding, aimed ultimately at making the human lot an improved one. ‘Truth is beautiful’, he said, going on to say that he would rather be insulted to his face (if the insult was motivated by truthfulness rather than mere unkindness!) than be told something soothing but without sincerity. Then we went into the discussion part of the evening and ultimately we ended up in pairs for our ‘conversational supper’. We were provided with menus outlining questions to ponder and discuss, and these included such ones as ‘How have your background and experience limited or favoured you?’, ‘Which parts of your life have been a waste of time?’, ‘How have your opinions and behaviour changed on the way the two sexes treat one another?’ and ‘What have you learned about the different varieties of love in the course of your life?’ All in all, there were twenty such questions from which to choose. Towards the end of the evening, Laura leant close to me (she knew I worked for Blackwell’s) and said ‘I don’t know how influential you are, but please make it so that Blackwell’s organises more evenings like this!’ The expressions and body language of around sixty other people in the room suggested that they would echo this feeling. Then Zeldin gave a brief conclusion to the evening, took a few questions and ended with a book-signing and perhaps the chance to ask one or two questions more quietly while getting your book signed. Empathy Week, of which this was the final event, seems to have been a thoroughly worthwhile experience. Many people would agree that there is far too little compassion, kindness and understanding in this world and that a good and humble starting point to redress that is simply to get to know better the people around us. By extension of that, how well do we really understand people from radically different cultures, or geographical locations, or experiences? Imagine if, en masse, all of us earthlings cultivated our abilities to empathise further than they currently extend. If that immense pang of love we may sometimes feel for a loved one or a close friend was extended to fellow humans generally, would that not be a worthy achievement for twenty-first century humankind? Marriage. We have our first Short Stories Aloud wedding in the offing! Their eyes met over a crowded room full of people telling stories. There is no better grounding for a long and happy life together. Cake*. Bring a cake (yes, or other baked goods) and you get in for free. There is always a LOT of cake. This is good, if financially insane. The guest authors for our birthday show on April 28th at 7pm are Daisy Johnson and Tim Clare, with stories read by wonderful Steve Hay and Shelley Harris. Our May 19th show features Lissa Evans and Stuart Evers. If you’re not cake-inclined, this cornucopia of delights is yours for only £5 (£3 for concessions). Hope to see you there! *in fairness, you could get cake first from our friends at Windsor’s Firestation Bookswap, but they are alas no longer running. • Would The Sixteen consider bringing a particular composer’s work to light who isn’t already that widely known in the mainstream classical world? If so who would you particularly like to pick? Part of The Sixteen’s brief has always been to bring relatively unknown composers’ work to prominence. We did this many years ago with our Eton Choirbook series (5 volumes) and, of course, in our early recordings for Hyperion we concentrated on the works of Taverner (5 volumes) and Sheppard (4 volumes). If you look through our catalogue you will find rarities – Portuguese music by Rebelo, Melgás and Teixeira and Tudor music by the likes of Tye, Parsons and White. This year’s Choral Pilgrimage is devoted to the music of Guerrero and Lobo and will introduce thousands of people to this wonderful music. • How much do you concern yourself with ‘authenticity’ within early choral music and how does this influence your interpretation of a musical score or manuscript? 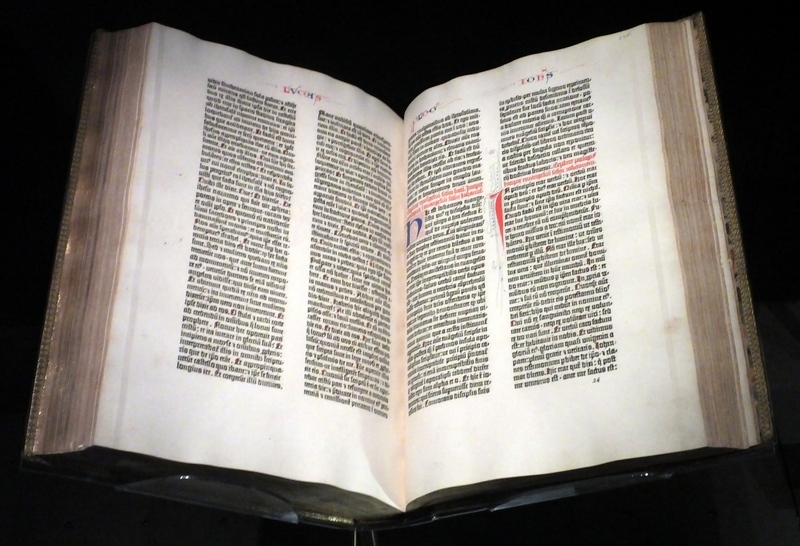 First and foremost the editions we use must be the best about, taking into account any new findings etc. Martyn Imrie is always scrupulous in his attention to detail when preparing editions. He produced the editions for this year’s Choral Pilgrimage as well as our Palestrina CD series as he has done with all the Spanish and Italian Renaissance music we have performed over the years. Likewise, Sally Dunkley is meticulous and ever conscious of presenting excellent performing editions of music from Tudor England. Of course we sing in a stylish manner befitting this music but there “authenticity” ceases. We must always remember that all of this music was for the adornment of the liturgy. What we are doing is taking it out of that context and bringing it into a concert programme and in doing so we must bring the music to life for a 21st-century audience. I make a point of interpreting the music, bringing out its emotional traits, and enriching the text. • Do you find you have to adopt a different approach for producing a recording than in a live environment? Yes – “live” has to be just that. The choir know full well that I may do something different in each performance. We never go onto auto-pilot. Different acoustics will account for variations in speed, dynamics and, indeed, my interpretation. Recording is completely different although I do like a more performance feel with longer takes and not being bogged down in total perfection. Of course there are many things I may do in performance which would not transfer well onto CD. • How much influence do you have in regard to where you record your performances, do you have a particular favourite venue or studio? I always choose the venue for our recordings. These days financial constraints mean we cannot afford to go outside London to venues where we know we will have peace and quiet with no extraneous noises. However, London does contain some glorious places for recording. My present favourite is St Augustine’s Church in Kilburn – there is a richness and a wonderful tail to the sound there which is perfect for both singers and instrumentalists. It is so diverse – last year we recorded Handel’s Jephtha, Monteverdi’s Vespers, Purcell’s Indian Queen and the Choral Pilgrimage CD of Guerrero and Lobo, so from a large ensemble for Jephtha to the more chamber feel of Indian Queen and finally the glorious a cappella music of Guerrero and Lobo. I also adore the fullness of sound that St Alban’s Church in Holborn produces and this is where we record our Palestrina series. In both of these places we use as little of the church acoustics or as much as we want – we never do anything that is artificial with the sound. • You’ve mentioned in the past that, apart from Classical repertoire, you like to listen to Led Zeppelin, do you have a favourite Zeppelin album? And would you ever consider arranging some classic Zeppelin tracks for a cappella voices? Are there any other rock bands you like to listen to? It’s a toss-up between Led Zepp 4 or 1… then again there’s 3!!! I’m a big Rolling Stones fan but I also like Ben Folds and Jack Johnson. I also love Jethro Tull and they us! We’ve just been touring Australia and John Evan came to our concert and loved it!! But no – I would never consider arranging tracks for a capella voices. Thank you Harry for the time taken to answer my questions. Good luck for your performance in Oxford! The third disc in The Sixteen’s acclaimed series of Polish music, conducted by Associate Conductor, Eamonn Dougan, explores the work of Grzegorz Gerwazy Gorczycki (1665–1734). Regarded as the outstanding Polish composer of the high baroque, Gorczycki studied in Prague and Vienna in his early years and returned to Kraków in 1690 where he took holy orders. He was appointed Magister capellae at Wawel Cathedral in 1698, a position he held until his death. Days such as last Saturday do not come along too often. 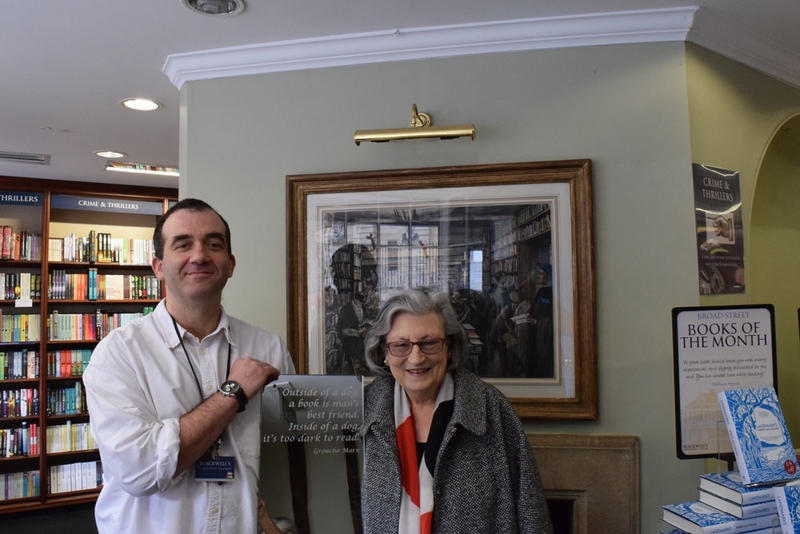 Not only was it the start of the annual Oxford Literary Festival but it was also the unveiling of the once-in-a-lifetime exhibition Marks of Genius at the newly refurbished Weston Library (formerly known as the New Bodleian). The whole of Broad Street was buzzing with excitement and no little awe as thousands descended on our little corner of Oxford. By all means take a look at the exhibition website, but seeing these items for yourself cannot be recommended highly enough. AND. IT. IS. FREE. 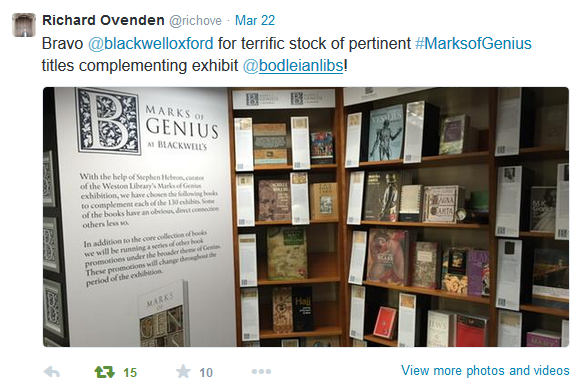 To see this tweet from Ricahard Ovenden, Bodley’s Librarian did, quite frankly, make my day. 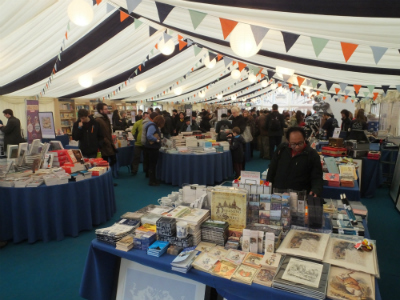 The Oxford Literary Festival may be considerably younger than the Bodleian but it has become one of the essential parts of the cultural calendar of Oxford. For the second year we were asked to provide the marquee and, with us being us, we decided to substantially increase the space that we gave to books this time. So not only is there a full A-Z run of books by Festival authors but there is table upon table of some of our favourite books. From early on the marquee was packed. 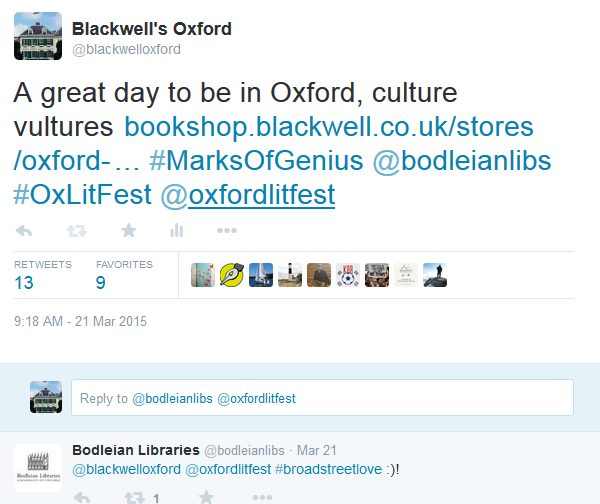 Nestled between the Sheldonian Theatre and the Bodleian library is really is a book lovers paradise. We were at each of the venues selling books for such luminaries as Simon Schama, Cressida Cowell and Eric Kandel to name but three. And so we move on from this exhilarating day. The Festival is in town until Sunday 29th, Marks of Genius runs until September the 20th and the Weston Library will stand gorgeous and proud for generations to come. We are honoured to stand next to it in a supportive, neighbourly fashion. The eastern end of Broad Street has never looked better. 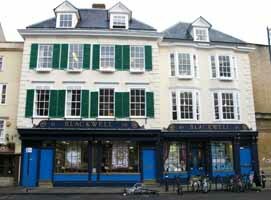 The bookshop is blessed in having so many wonderful customers who many of our booksellers class as friends now. Every so often one of these lovely people does something that melts our heart. Here is a recent example. A wonderful woman is a regular visitor to the shop and she approached us to talk about the lack of a mirror in our disabled toilet. She said that she wanted to provide one and would not hear of it when we said that it was something we should do. She had the idea of a bookish quote being engraved on the mirror but was not sure what quote would be appropriate. Her suggestion was that our booksellers should vote on the quote to use. So we did. Groucho Marx won.